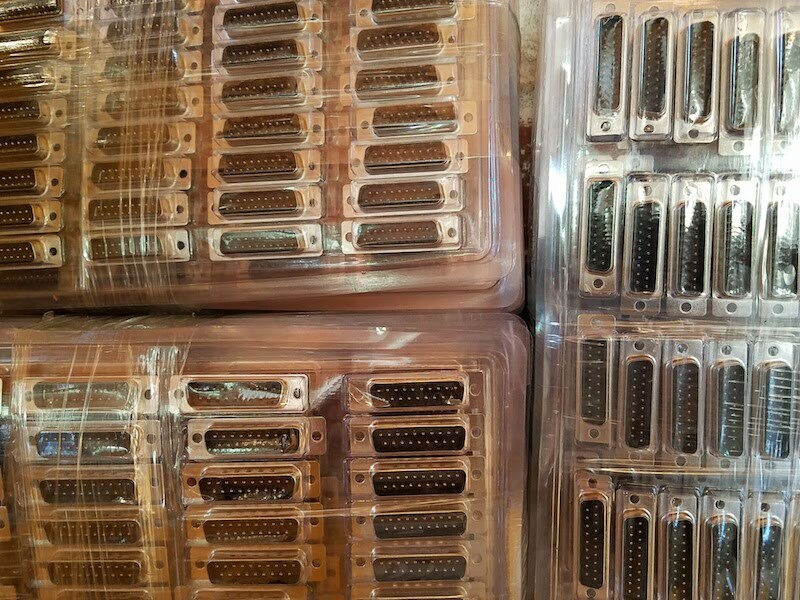 Oops, I did it again: another 10000 DB-19 connectors fresh from the factory! After helping to resurrect this rare retro-connector from the dead in 2016, and organizing a group of people to share the cost of creating new molds for manufacturing, I had some of the 21st century’s first newly-made DB-19s. The mating connector is found on vintage Apple, Atari, and NeXT computers from the 1980s and 1990s, so having a new source of DB-19s was great news for computer collectors. But that was two years ago. After manufacturing, the lot of connectors was divided among the members of the group buy, leaving me with “only” a few thousand. Since then I’d used up more than half of my share in assembly of the Floppy Emu disk emulator, and I began to get nervous about the looming need for a re-order. It was such a big challenge the first time finding a Chinese manufacturer for the DB-19s, and the all-email company relationship was tenuous. What if they lost the molds? What if my contact there left the company? What if the company went out of business? Even though I didn’t absolutely need more DB-19 connectors until 2019 or 2020, I decided to lock in my future supply and order more now. I needn’t have worried, and the transaction went smoothly. 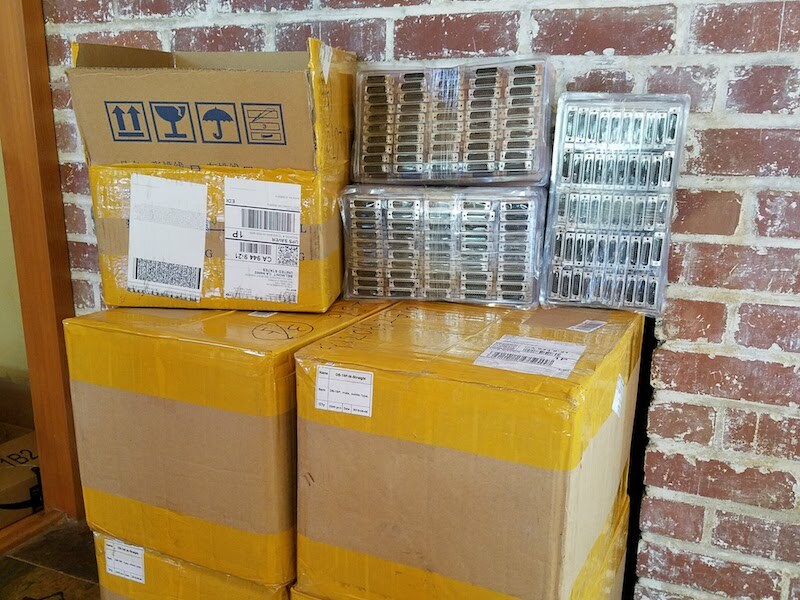 With no mold costs to pay this time, the only challenge was meeting the 10000 piece minimum order quantity. I was even able to pay via PayPal, instead of enduring the hassles and weird scrutiny of an international bank wire transfer like I did in 2016. How much are you going to be selling them for? I’m sure others have asked, but have you thought about producing the DB23 (IIRC) the Amiga uses for video? Great stories about just one piece of a much larger story in trying to build new-ancient equipment. I greatly appreciate your efforts and was able to finally transfer some 20+ data on some 800K Mac floppies with the help of the Floppy Emu. Plus I had some fun getting some additional use out of my Mac SE. 2. If your intent is to archive the *contents* of your floppies, rather than exact images of each floppy disk, there’s a much faster way than making 200 images of blank floppies. Just put the Floppy Emu in HD20 mode and use it like a hard disk, then copy the contents of all 200 of your floppies to that one. It will appear as one big disk image file on the SD card. 3. If you have a Windows PC, HFVExplorer is much more convenient than the combination of Mini vMac and ImportFl/ExportFl. It can directly open .DSK disk images and copy out their contents to the host operating system. 4. If you have a modern Mac (OSX), you can directly open disk images from the SD card if they’re in DiskCopy 4.2 format (typically with a .img) filename extension. Floppy Emu supports this format too, and you’ll notice some of the sample disk images are .img images. However this format is a little bit slower to use, so Floppy Emu prefers the raw .DSK format for most things. Actually I have point #4 backwards. Mac OSX won’t open Disk Copy 4.2 .img files – it complains “legacy image should be converted”. But it *will* open .dsk files if you change the filename extension to .img. I just had fun opening up a bunch of old System 6 and System 7 .dsk images on my MacBook Pro with High Sierra. 2. Fortunately, it was only a handful of Mac floppies I had to archive. The majority of the 200 disks were PC-formatted. 3. Most of my work is done on a Mac, but I’ll try out HFVExplorer if I need to access Mac files and disk images from Windows. 4. Thanks for the tip. I’ll need to give that a try. If that works, I’ll need to amend my blog post. About $3500 including fees and freight costs. The biggest cost (custom mold) was already paid previously in 2016, so these were cheap on a per-unit basis.